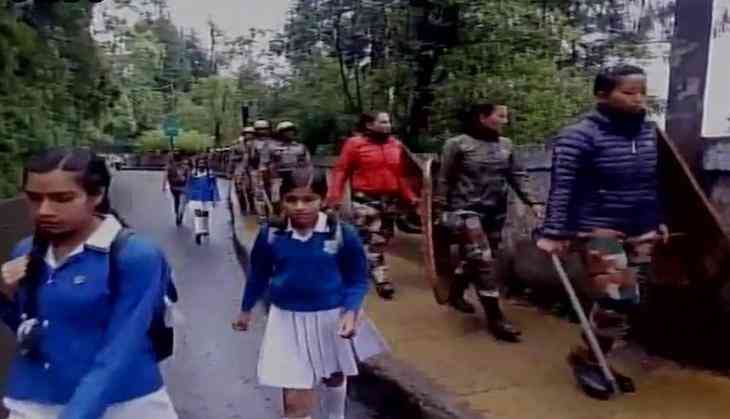 Paramilitary troops were patrolling the streets of Darjeeling on 12 Jun morning to prevent any untoward incident during an indefinite shut down of the city called by the Gorkha Janmukti Morcha (GJM). Monday's GJM-led shut down call came a day after the Mamata Banerjee-led Trinamool Congress government in West Bengal had issued an order that all offices have to remain open in Darjeeling and Kalimpong. The state government order also made it mandatory for government employees to attend work. "In view of the call given by Gorkha Janmukti Morcha for indefinite bandh/strike on and from 12 June, 2017, it has been decided that all state government offices situated in the District of Darjeeling and Kalimpong, including those provided with grants-in-aid by the state government, would remain open and all the employees of those offices should report for duty on each day till the call for such bandh is not withdrawn. It has also been decided that no leave shall be granted to any employee on any of these bandh days," said a state government release. State Governor Keshari Nath Tripathi also announced that absence of employees from work would be treated as 'dies non',and will constitute a break in service. GJM President Bimal Gurung and other party leaders have challenged Mamata Banerjee and her government to try and stop them from achieving their cherished goal of a separate state of Gorkhaland. GJM General Secretary Roshan Giri said on Monday that the party would ensure that all central and state government offices - including block development offices, sub-divisional offices and district magistrate offices, banks, Gorkhaland Territorial Administration (the hill development body) offices - will be closed as part of the shutdown. Schools, colleges, transport and tourism will be outside the purview of the shutdown, he added. State government revenue sources like electricity, mines and boulders will be part of the GJM's shutdown, Giri said. So far, five GJM activists have been arrested, and flag marches by the army have been withdrawn. Many tourists are still stuck in Darjeeling. GJM president Gurung has advised tourists to leave the hills because of the possibility of "untoward" incidents. A state of uncertainty, however, continues to prevail. Further details are awaited.